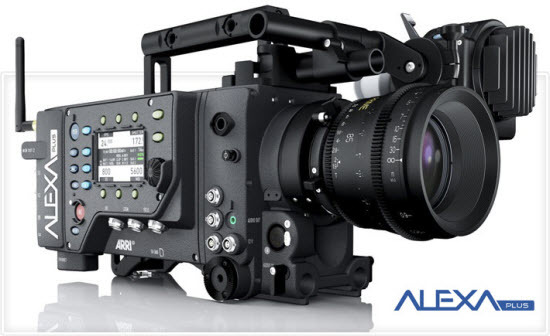 The Alexa camera is is equipped with an onboard SxS card encoder that can record in either Rec. 709 or Log-C Prores 422 or Prores 444 codec as well as DNxHD in 1080p resolution. For an additional 1,350 Euros, Alexa camera owners can purchase a software “key” that will unlock the camera’s ability to record up to 120fps in ProRes 422 HQ. The camera is designed for use in high budget feature films, television shows, and commercials, and is widely seen as Arri’s answer to the growing acceptance of the Red One camera, along with lower resolution cameras like the Sony CineAlta, Panavision Genesis, Thomson Viper FilmStream to shoot feature films. ProRes has proven to be a high quality and robust video format that is widely used in the industry today. The capability of recording directly in Apple Prores format provides a shoot to edit option for the workflow of Alexa with FCP X. However, if you record video with Alexa in other format such as DNxHD or Rec. 709, the workflow will not be so smooth, since FCP X does not handle those videos very well. To fix this issue, you’d better transcode Alexa camera files to Final Cut Pro native compatible editing format- Apple Prores codec. Apple ProRes 422 (Proxy) – Used in offline workflows. Apple ProRes 4444 – Edit and finish 4:4:4 material. Mac users who have problem of working Alexa camer video in iMovie can also use our program to achive a better editing workflow by transcoding to iMovie best preferable Apple Intermediate Codec. How to transcode Alexa camera recordings to Apple Prores codec for FCP editing? Step 1: Copy Alexa recorded footage to Mac hard drive. Insert your SxS card into your MacBook Pro’ s ExpressCard34 slot. If you have a computer without an ExpressCard reader, then use the Sony SBAC-US10 SxS Memory Card Reader. The card will show up in your finder as ARRI UDF. UDF stands for Universal Disk Format, which is an open file system. Step 2: Add Alexa camera files to the program. Launch the program on your computer, click “Add Video” button to load Alexa camera files to the program. Step 3: Choose output file format. Click the “Format” bar, from its drop-down list, select to out “Final Cut Pro”> “Apple Prores 422(*.mov)” format for editing with Final Cut Pro X. 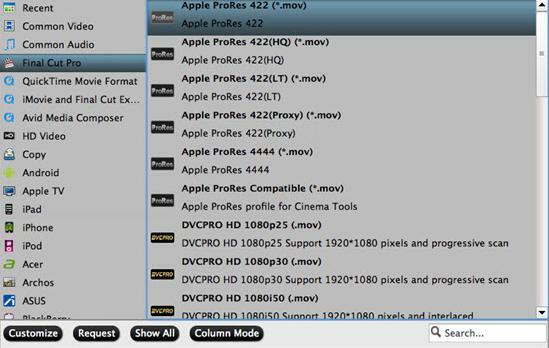 You can also other Apple Prores formats according to your own requirements. On the main interface of the program, check “Merge into one file” option to combine all the separate video footage into single one. After everything is set done, hit right-bottom “Convert” button to start Alexa camera to FCP X Apple Prores conversion process. When the conversion is complete, click “Open output folder” button to get the converted files, then you can easily import converted videos to FCP X for professional editing.